GIVEAWAY: Win a Year's Supply of Replenish Eco-Cleaning Products! 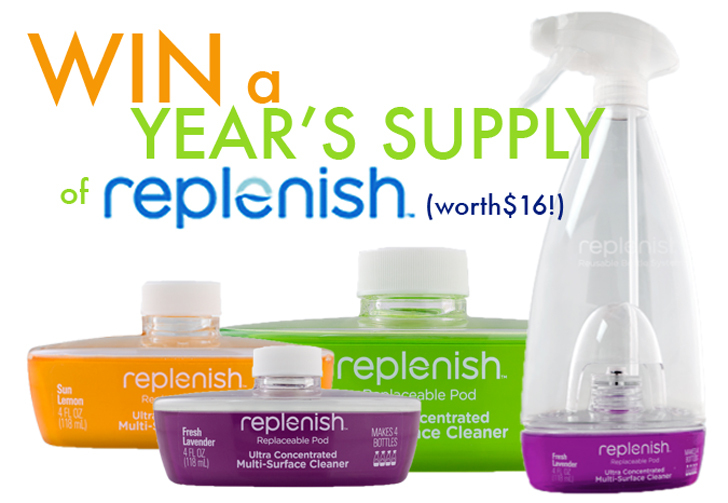 GIVEAWAY: Win a Year’s Supply of Replenish Eco-Cleaning Products! Cleaning up shouldn’t require a hazmat suit, but with all the toxic chemicals that make up today’s household products, it might not be such a bad idea. To help you get your home squeaky clean in a healthy way, we’ve teamed up with Replenish to give five lucky readers a year’s supply of Replenish cleaner! Replenish’s cleaning system features a 98% plant based-cleaner and a replaceable concentrate pod bottle system that reduces plastic waste, energy and CO2 emissions by 90% and saves consumers 50% over the cost of traditional cleaners. If you’re looking for a green alternative to keeping those dust bunnies at bay and your countertops sparkling, then jump ahead for details on how to win! Each winner will receive one bottle of Replenish Multi Surface cleaner in any given scent, and two additional replacement concentrate pods of each of the three scents Replenish comes in – sun lemon, fresh lavender, and green tea. The Replenish system focuses on sustainable practices through the use of reusable bottle and concentrated pods, removing the need to ship water. By supporting innovative product companies like Replenish, we can change the status quo and lower the amount of plastic wasted every year and the amount of CO2 released into our air. Check out Replenish’s Facebook page here and give them a thumbs up for their efforts! 1. SIGN UP FOR OUR NEWSLETTER HERE > (If you are not already a subscriber). We’ll be announcing the winners in our weekly newsletter, so if you want to find out if you won, you’ll need to receive it in order to claim your prize! 2. LEAVE A COMMENT BELOW and share your favorite home-brewed cleaning solution (extra points if it does double duty and is edible)! The deadline for this fabulous giveaway is Tuesday, August 16th. We’ll pick the top 5 comments and announce the winners in our newsletter, so make sure you’re signed up! This Product is so amazing, I bought it about two months ago and it is still going strong, it cleans so well, you don't need to spray a lot and it cleans and lifts dirt really well, I love it, only thing is they don't seem to be selling in at Tesco any more so I can't buy any more refills which is sad because I love that you don't need to buy a new bottle every time and it smell really good and doesn't upset my asthma, please get Tesco to sell it again because it is the best invention I have ever bought!! hot hot steam. no chemicals. no scrubbing. just water and heat. Baking soda, salt (for an abrasive), vinegar and lemon juice! I use combos of these for everything. I never even step into the cleaning aisle anymore ;) although this product intrigues me and I would love to give it a go! Like many above, I use white vinegar to clean just about everything. My family and I haven’t use any more regular cleaning products since my sister got sick and was on treatment few years ago. Her doctor prevented us about the potential harm of chemicals for her health. Since then we definitely have turn our life around in a lot of aspects, paying more attentions to the products we use at home and what we eat. We have used green products and vinegar with water as our way to clean our house! Food grade hydrogen peroxide, although I use vinegar more often. Also, lemon essential oil (diluted) makes a great cleaner (or addition to other natural cleaners) and smells wonderful! White vinegar to clean windows, a mix of vinegar and baking soda to clean sinks, drains...vinegar to kill weeds in the garden. Dry Lavender flowers to keep moths from my woolens, sweaters. Lavender oil in water for spray feshner. A mix of vinegar, water to clean pergo floors in a spray bottle. Lemons in a dish of water in microwave, cook to boil and leave in microwave for cleaning microwave. Tea tree oil to desinfect counter tops...etc. i must track these products down, and start using immediately! Vinegar for everything! After cleaning my house the smell always makes me crave french fries though :P For more stubborn messes I just mix it with some baking soda! I like lemon, vinegar, baking soda, mint and rosemary leaves for the smell. I think it's edible, but I prefer other things. Rules to go by when im making my own household cleaning products. 1: Is this cleaning product something i can eat? 2: Does this cleaning product have antibacterial properties? 3: Does it smell nice? I use vinegar,baking soda, and essential oils for most of my general cleaning. Essential oils are good not only for custom added scent but for their germ fighting properties as well. For example: Sage,Rosemary and Eucalyptus all have antibacterial properties. I even use these three ingredients to make my own laundry cleaning solution. For a more abrasive cleaner for areas like tile grout and stainless steal scrub i make a paste using baking soda, salt, and lemon juice. This is amazing for whitening tile grout! And it smells like lemon cake batter. Sometimes, when i have the time i like to boil dried sage,rosemary, lemon rind in some water to make a super cleaning tincture like mix.Please note : ingredients are boiled in a tea bag. Sometimes i drink a little if there is too much. Once the water has cooled i add vinegar to the mix. I use this mix everywhere from kitchen counter tops,glass tops and bathroom. I use lemon, vinegar, and baking soda to clean every where! Works well. Vinegar and baking soda for everything! APPLE CIDER VINEGAR...and baking soda!!! I have an organic garden and unfortunately planted some bell pepper plants that have contracted BLIGHT (gasp)! Besides the recipes, health benefits, and cleaning purposes for apple cider vinegar, it can also be used as an organic solution to blight (as compared to the horrible and toxic chemicals commercially sold & used). (1) Dig out the infected soil & throw away in trash..>DO NOT COMPOST! (2) Mix 1 cup of a.c.v. to 1 gallon water.Pour over infected areas. Let dry for 1-2 days, then repeat 2 more times. (3) SANITIZE any tools/buckets/etc that touched the infected soil. At the end of the season, sprinkle and mix in baking soda into the ground. Here's a helpful tip for cleaning the grout on your tile floors in our kitchen & bathroom: Make a simple paste out of baking soda and water. Apply the mixture and allow it to sit overnight. The next day, scrub with a soft bristled brush and repeat as necessary! I use vinegar and baking soda for a number of things -- not just cleaning but also to deodorize my kitchen sink drains. However, I do find the aroma unpleasant, which is why I'd like to get my hands on some Replenish instead. I've heard from a reliable source that it cleans just about anything you can think of, including stains from wine, grease, and blood on clothing. It would be great to replace five or six other cleaners with one bottle of Replenish. I use vinegar and baking soda for scouring, use salt often in my wash to keep the colors bright and sometimes use lemon and baking soda for brushing my teeth. Excellent product idea and design! Here are some of my tips: Marble Counter Tops For cleaning my marble counter tops, I first use a glass/tile scraper which removes anything stuck to the counter. This saves me time and elbow grease. Then I use an ecological spray to clean it. Bars of Soap For my soap dish in the bathroom, I use a deep dish and fill it with river stones etc. and place the bar of soap on top. That way the soap doesn't sit in a pool of water left by the kids or a guest. Coffee/Tea Stained Mugs I use a mr. clean magic eraser for coffee/tea stains in mugs. I cut off a bit of the sponge at a time instead of using the entire sponge at once and throw it out once it looks like it is dying. Me, both as a designer and consumer, pay much attention to the product I purchase. Content, package , and ingrediants. Such a product group not only attract attention by their package design as they all have pure-minimal packages but also the differention by colors is another aspect of communication. Introducing such products with different type of design-purity, help us to distinguish the environment-friendly better . Wow, seems like a pretty great product! For scrubbing i use beaking soda, otherwise i don't really have home-made recipe, i just try the buy the greenest products i can find, like Lemieux (here in Quebec) where you can bring your own bottles to re-fill with their eco-friendly liquid soaps. Skin is a delicate thing. It needs looking after. It is great to see others interested in steering away from chemical products and thank you to you guys for doing what you do to promote that steer! We use 2 tbsp of bicarbonate of soda with 500ml of warm water with one tbsp of lemon juice or vinegar, whichever we have more of to hand. Elbow grease is of course also a must-have ingredient! This was learned from the exceptional Alexandra Jamieson. I use lemon and lime essential oils mixed with a natural base shampoo to do the dishes!! Makes them squeaky clean!!! We are starting to get into using vinegar to clean everything. We have a little one on the way, due in October, and know that our cleaning will become more frequent and doesn't need to involve chemicals. We had been using Seventh Generation but knowing that simple cleaners can be made with items we already have is so exciting! There are a lot of great tips in these comments. At home, we use spray bottles filled with one part organic dish soap, two parts white vinegar and three parts water. It works wonders and can be used almost everywhere. I have found to clean a fridge and leave it fresh and clean all you need is hot water and pure vanilla essence. I like to use hot chocolate powder which works like an abrasive to clean the tea stain rings in my tea cup. I love using lemon and hot water to clean the microwave! I use a solution of distilled water and a few drops of oil of peppermint to freshen my counters. Water with a few drop of vanilla essence is great to soak fabric which have encounter such hum... cat pee, amongst other things! this strikes me as a design problem. I am looking at smartskin countertops. Basically this is a biomimicry solution that allows the countertop to digest your bread crumbs and with the energy thus created power your garbage disposal. The only problem is you shouldn't leave your banana (or your tuckus) sitting there too long! I like to REUSE! So after I've squeezed the juice from a lemon into my food or drink, I take what's left (basically the peel) and run in through the garbage disposal. This helps clean it AND removes odors. That way one lemon serves me twice--for flavor AND for cleaning. I am always mortified at how much my family throws away every day. And chance we have to reuse anything makes us feel a little smarter and less wasteful! Looks like this bottle is great for that too! I use all of friendly eco cleaning products. I use all of Eco Friendly products when I clean things. I'm still new to this so I'm at the baking soda / vinegar level! I use the combo weekly on all the drains to clear them out and deordorize... and in the toilet as well! I'm using vinegar to take care of the weeds growing where they aren't supposed to be and now I'm researching natural cleaners to replace the icky chemical ones we use! This would help a lot! In my home we use vinegar for just about everything now. With 4 dogs, one of whom has a bladder control problem in her old age, we've had to pick up a lot of "accidents." My parents use to use harsh cleaners to do so until one day I suggested we just use vinegar, as it would be a better choice and probably better for our hardwood floors. It worked perfectly and now we're using it for almost all our cleaning needs. 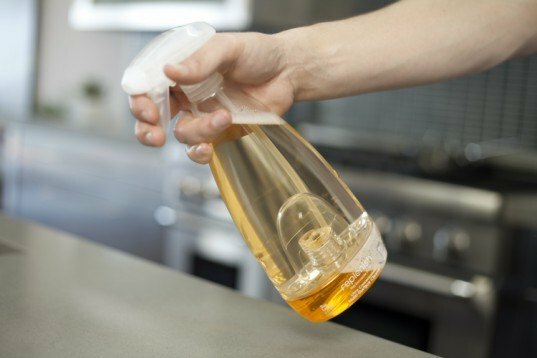 I tend to use a lot of vinegar in a pinch, it works well and I suppose you could take a swig while your cleaning If you wanted to! Borax and baking soda works well when you run out of dishwasher detergent too. Don't think I'd eat it though. Vinegar and water... great for windows, floors, and counter tops; toddler and pet friendly. I like to use old newspapers to wipe windows, it leaves a lot less streaks and saves the paper towel! Baking soda, a little water and a rag, what a great way to clean my kitchen! Lemon juice and baking soda are a hit at our house. It's not exactly a cleaner, but I have found a sprinkling of cinnamon along their trails discourages ants. And it smells nice, too. I put a cup of water with some vinegar and a few drops of (non-toxic) dish soap in my microwave and turn it on for a few minutes. When it's done, I only need to wipe it out and it's sparking! I am expecting some friends at the house and need to clean. Replenish Multi Surface cleaner looks like cleaning much more enjoyable! I am expecting some friends at the house and need to thoroughly clean. Replenish Multi Surface cleaner looks like cleaning much more enjoyable! Wow! looks and awesome idea! It could be posted in paraquelimpies blog too. I definitely use jelly. It doesn't clean so well, but it gives me an excuse to lick the windows an counter-tops. I am due with my second child in November and with a three year old already keeping me busy I am looking for a fast, easy and green way to keep my house looking nice. This product sounds like it is just be the ticket. If I win a years supply it will be one less thing a busy mom like me will have to think about while keeping my family and I on a healthy green and clean path. Gee, 3M Scotchbrite's Dobie scrub sponge isn't edible and I don't even know how friendly it is in production, however it remains my favorite for washing dishes. I dilute dish soap, usually about 1:4 or 1:5. The Dobie is really good at retaining soap through a sink of dishes and since it's diluted, I don't have to run the tap on the sponge. For a faucet when the water tilts sideways: dip faucet in bowl of vinegar for a few minutes to get rid of calcium deposits. I have a few ways of eco-friendly -and- cost saving ways of cleaning/freshening my house. Instead of using any air-fresheners/fabric fresheners, I use a spray bottle with a few drops of essential oils of lavender (not too many -- I don't want to get any residue on any fabrics) and water, and spray; this also works really well for taking wrinkles out of clothing since I don't like to iron! I'll spray a shirt and hang it in the bathroom while I shower. Instead of fabric softener, I use white vinegar, water, and an eco-friendly conditioner (the "recipe" is supposed to be 4 parts to 3 parts to one part, but I find it too "vinegary," so I use more like 3-3-1). Clothes are perfect, and not toxic. Finally, for polishing silver (and cleaning just about anything else) -- baking soda and recycled tin-foil. Especially for the silver, it takes the tarnish right off. Vinegar! not just for salads and jelly fish stings! Cleaning up shouldn't require a hazmat suit, but with all the toxic chemicals that make up today's household products, it might not be such a bad idea. To help you get your home squeaky clean in a healthy way, we've teamed up with Replenish to give five lucky readers a year's supply of Replenish cleaner! Replenish's cleaning system features a 98% plant based-cleaner and a replaceable concentrate pod bottle system that reduces plastic waste, energy and CO2 emissions by 90% and saves consumers 50% over the cost of traditional cleaners. If you're looking for a green alternative to keeping those dust bunnies at bay and your countertops sparkling, then jump ahead for details on how to win!